You can also receive a 1.99% introductory interest rate on Balance Transfers for 9 months with a 1% transfer fee with this card. This will be useful, if you have a high balance on another credit card. 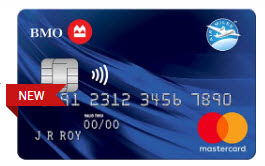 Note: Existing BMO AIR MILES Mastercard customers who cancel their card during the Offer Period, and existing BMO Mastercard customers who transfer into this product during the Offer Period are not eligible.